Addemar Support Knowledge - How do I upload contacts? You can import (upload) contact details from your local applications via a file in XLS, CSV, XLSX or XML format. Files with a file size below 8,00 MB in formats .XLS, .CSV, .XLSX or .XML can be imported directly via the import function. For larger files, use the FTP functionality to upload your contacts file. We recommend to use the CSV format for importing. CSV files can be created manually in Microsoft Excel. Define columns for each contact detail, and give clear labels to each column. Choose Save as... and select CSV (*.csv) when saving. First things first, make sure you have your contacts data file ready. Click the contacts submenu from the left navigation bar in the interface. Click the Import button from upper right bar on your page. An Import dialog opens up. Click the Browse button and select the file to import from your local pc or network. Fill in the source. This is a free text field. The source text is stored in the contact history to be used for later reference. You can chose whether you want to update existing contacts. If you select Yes, the details of contacts in your account that corresponds to contacts in the imported file will be overwritten. If you select No, only new contacts will be added into your contact group or addemar database. 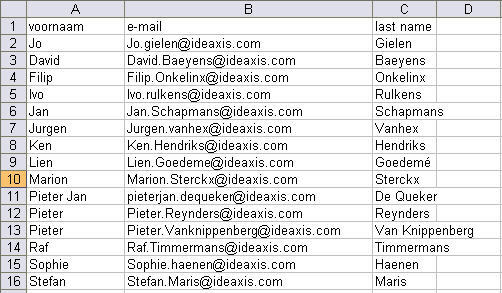 Indicate to which mailgroup(s) you want to assign the imported contacts. Match your file fields to corresponding addemar fields. If you see a (new) value inside the Field column this means that the import will create a new field inside your contacts database. We tend to prevent this and try to match al your column fields to corresponding addemar fields. Click the Import button to start importing. The result of your import action is shown in a new popup screen. You can export an overview of invalid and/or double contacts. Click the icon. Invalid contacts are not imported, double contacts are imported only once. Note: Unsubscribed contacts will also be updated, but they remain unsubscribed. Importing contacts overview made better! How do I maintain my contacts?